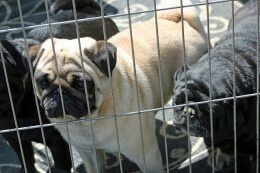 Pug Behind Bars. Photo Credit: Marcia O’Connor. Last week, Mark Meechan was sentenced to a £800 fine after he was previously found guilty of committing a hate crime. The opinion-dividing Scot had published a video on YouTube featuring his girlfriend’s pet pug (not so aptly named Buddha) responding to anti-Semitic slurs. He was found guilty under The Communications Act for posting the video, which was deemed “grossly offensive” due to its “anti-Semitic and racist nature”. Meechan has said he plans to appeal the sentencing. Here is the original podcast from Aaron and Steph, as they went Head2Head on this topic, featuring free speech, hate crime, and pug rights. We want to hear your thoughts too, feel free to comment below.